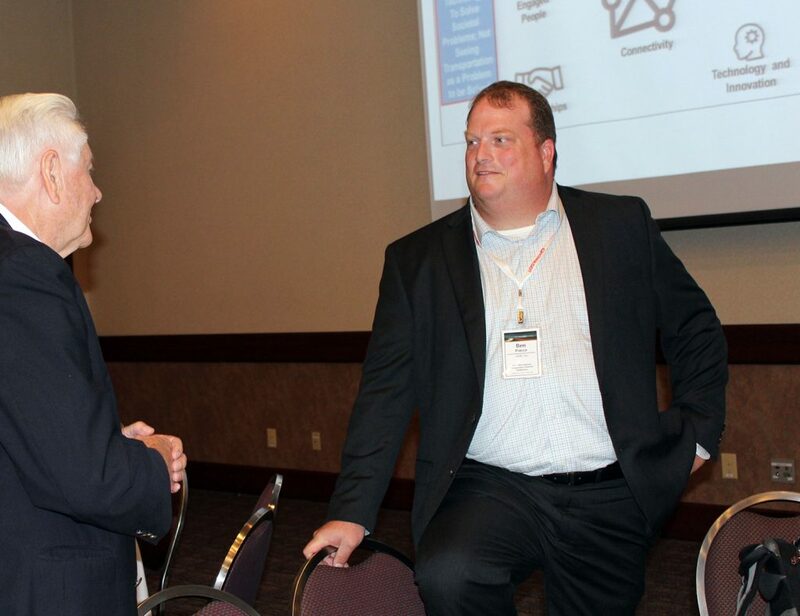 Ben Pierce, right, visits with Ray Mundy of the University of Missouri-St. Louis following Pierce’s keynote address Aug. 16. When Columbus, Ohio, won the U.S. Department of Transportation’s Smart City Challenge grant last year, Ben Pierce said the winning application did not see transportation only as a problem to be solved. Pierce is the Transportation Technology Program Lead at HDR, a global firm specializing in engineering, architecture, environmental, and construction services. He was one of the lead authors of the Columbus application and is known as a thought leader on transportation technology and smart cities. He was the keynote speaker at the biennial research symposium, sponsored by the Iowa Department of Transportation and the Institute for Transportation at Iowa State University. The U.S. DOT launched its Smart City Challenge in 2015, seeking ideas for an integrated and unique smart transportation system. Pierce said Smart City features could include connected vehicles that communicate with other vehicles intersections, inductive wireless charging to charge electric cars and buses, and the use of shared autonomous vehicles. Pierce said the Columbus application aimed to use transportation to “change lives of everyday citizens.” Specifically, it proposed solving infant mortality with transportation technology to improve mobility and access to health care and other human services. He said support grew for the project grew once the aim was to use transportation to address a social issue. Also speaking at the two-day symposium were Mark Lowe, Iowa DOT Director; James Bryant, Senior Program Officer-Maintenance and Preservation Engineer for the Transportation Research Board; Karen Bobo, Federal Highway Administration Iowa Division Administrator; and Sri Sritharan, Interim Assistant Dean for Strategic Initiatives, ISU College of Engineering. The symposium welcomed about 290 registrants from Iowa, 13 other states, the District of Columbia, and one from the United Kingdom. In all, 81 presentations took place including 26 poster presentations.